Cut the meat into pieces the way you want. Let the griller be hot and put the meat on top. Change the side so that it doesnt roast to much. Put down 3 stones on the ground. Lit a fire in the middle and place the wire mesh on top of it. Then put the meat on top of the mesh and grill. Cut 3/4 tomatoes into slices, then cut the onions (into halves) and mix them with the tomatoes, then cut a lemon into 2 halfs and squeeze the lemon on top of the tomatoes and onions to get the lemon juice. Mix the 3 and put some salt in it. You can put some chilli or pepper if you want. N.b. 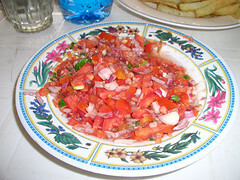 Tomatoes and onions can be added as many as you want. Foound your recipe simple and useful..I live in australia, sydney and will try it out..Ohh how I miss our yummy tasty food!!! A wonderful recipe for Chrismas.